The CIELAB colour space was defined in 1976 by the CIE to standardize a method of colour differences (how different are these two red paints?). CIELAB can be seen as modelling colour appearance, rather than modelling light intensity as in an RGB space or in CIEXYZ. Since CIELAB is a reasonable predictor of visual response, we can use it for other perceptually based tasks such as mapping colours or hues. 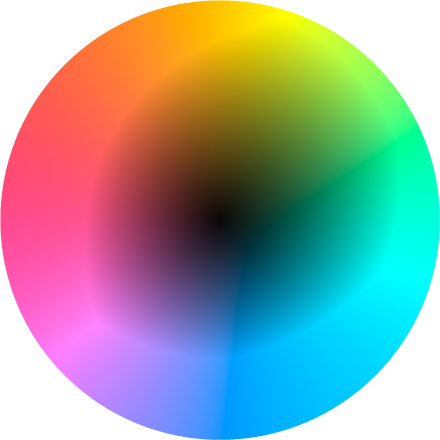 Below is my rendering of the CIELAB hue circle in sRGB. Since many of the colours in this hue circle are not representable, I used a simple (and therefore pretty terrible) gamut mapping algorithm. This is a descriptive representation of the CIELAB hue circle, from Bruce MacEvoy's handprint site. 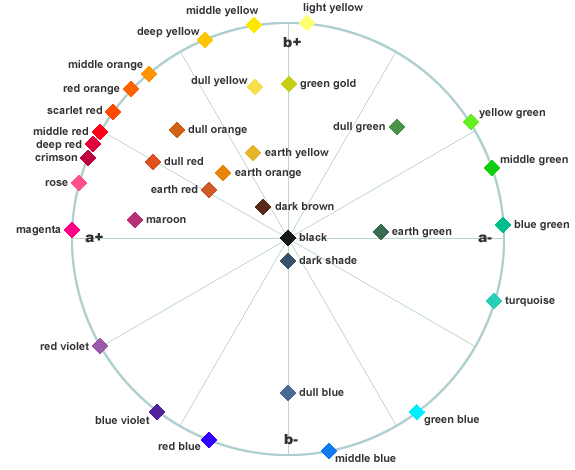 It very nicely shows how the space distributes some of the important hues. 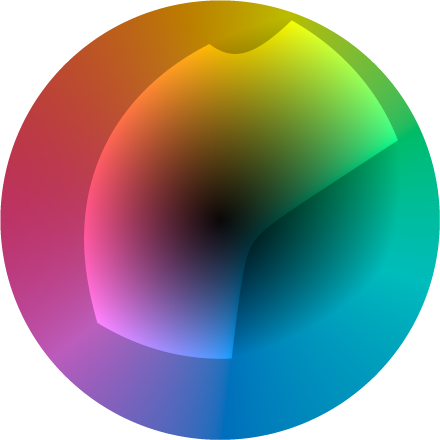 Finally, here is a rendering of the CIELAB hue circle, hilighted to show representable sRGB colours. The dim region is the area I had to map into the sRGB gamut. I am still not happy with the gamut mapping of the above rendering. Here is the set of hues along a constant chroma of 40 and a constant lightness of 74. All of these colours are in gamut for sRGB. The following is an exaggerated set of hues, with chroma 100 and constant lightness 74. Many of these are out of gamut, and have been clamped. Some notable colours and their complement in CIELAB.